13 Questions is a weekly series where we ask chefs 13 questions to get to know them outside of the kitchen. 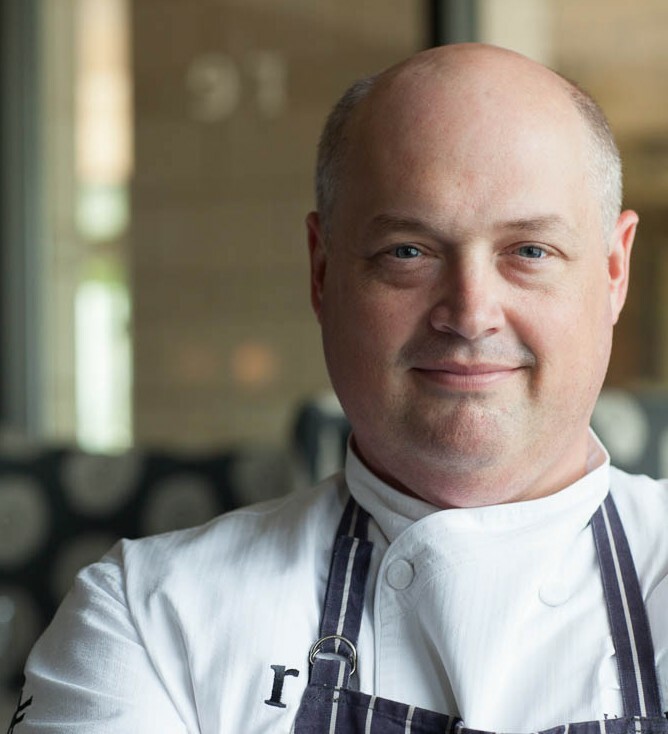 Linton Hopkins is chef-owner of Restaurant Eugene, Holeman and Finch Public House, H&F Burger, The Cafe at Linton’s, and Hop’s Chicken. When you aren’t cooking, what do you do for fun? Ping-pong is one of my favorite things. I am a dad with two teenage kids [Linton, 16, and Avery, 14], so it’s playing a lot of cards with them, eating, and watching a movie. I’m sort of a classic 1950s dad. And traveling with the family is the best. We went to Charleston recently, and we’re going to Little Rock to pick up a poodle next month. Do your kids help out at all in the kitchen? My son and daughter know how to cook and bake. My son helps out in the front of the house and back of the house. He currently works as a utility worker at Restaurant Eugene on Friday nights. He’s worked in our commissary kitchen and catering with me, too. Avery for Thanksgiving made this amazing pear and pistachio cake; she mise en placed it all out herself, built the layers, and iced it in place. Food is so much bigger than the restaurant business; it begins in homes where we build relationships around food. My house is my test kitchen. You have to unchef your universe. What’s the best and worst thing about working with your wife, Gina? The best thing is we get to work together. We share such a love of hospitality, food, and beverage, and just being around her as much as possible is great. She’s the love of my life. The worst is we can get into fights over the most silly things. We got into a bad fight about slicing brioche. This was at Restaurant Eugene in the second year. It was the only time we ever fought in front of our team. I cut a perfect wedge of warm brioche, but our GM told me to slice it, and I said, “No, we’re sending it out.” So he went and told Gina, and she told me, “No, you have to slice it.” I learned my lesson that I have one boss. My wife and I love the show Survivor. It is the most campy, fun thing, but it really gets into human dynamics. Has your Emory anthropology degree ever been useful in the kitchen? I feel like I am an anthropologist of food in a lot of ways. You use anthropology a lot in why people cook, how they cook, how they develop the traditions around what they cook. When we were asked to partner with the Atlanta Botanical Garden, I was using scholarly techniques to research botanical gardens. The research informed what kind of food would be there. Gina makes me a better person because otherwise I would have Oreos. I spin the Oreo off the cream, and I love having milk with it where you can dunk the cookies. If you weren’t a chef, what would be your dream job? I love books, so I would love to own a bookstore. I’ve even thought about [how] part of building all these businesses is so I can eventually open a bookstore with a great little cafe; there would be coffee, [pastries], and vintage books and new books, too. My job throughout college was working at Mellow Mushroom, but I also worked at Oxford Bookstore. I loved every section, reading up on history or finding yourself in foreign language. You attended CIA. Is culinary school worth it? Absolutely. It is one of the fondest education memories I have. It was a introduction into a professional culture, a guild with its own rules and society. The benefits that come from that, the culture building and the relationship building, continues. I am now a fellow of CIA, and I am recognizing how great the alumni network of graduates is. The other side was the content: Here you are with the top educational chefs in the world, learning from them about the nuances of frying french fries. I studied french fries for two weeks and did a presentation on frying with multiple fat types, different potatoes. But the danger of culinary school is the assumption you will exit culinary school and be a chef. You exit culinary school on the path to becoming a chef. Being a chef has everything to do about organizing professional teams around a goal; it’s like being a football coach or a platoon sergeant. Being a chef is like being a black belt in karate: It’s not the end of your career; it’s the beginning. You never stop learning because there’s always something you can learn to cook. There’s this one dish that is the number one dish on my list, and it’s from a Pâté & Terrines German cookbook: the truffled trophy. It’s an entire boar’s head filled with boar and truffle meat glazed with brown chaudfois. It’s multiple days, and it’s a really test. I can tell you without a doubt I’m going to do it because it’s on my bucket list. You grew up here but moved away. What made your return? I’m an Atlantan. This is my town. This is where my father’s family is from. It was always about living here. Then of course with kids and thinking about how personal restaurants are to me, I wanted it to be in my home in Atlanta, and businesswise I saw a lot of opportunity. Atlanta is an amazing restaurant town. It doesn’t get much credit, but you don’t need to leave your neighborhood to eat well, and that’s amazing. I’m the old guy, and I’ve only been here 12 years. Rudeness. I wish there was more civility in our everyday life. We ask people in our kitchens to use words like please and thank you . . . Etiquette is not a doily on your grandmother’s tea table; etiquette means you actually care about other people. It starts with just being polite. Bullies really bother me; my number one pet peeve is a bully—that makes me angrier than anything. We fire people for being rude because anyone can cook. What would be your dream restaurant location? Brookwood train station. That building is iconic for me: I love trains, I love the architecture of it, and I love food service in what I consider important buildings.